In March, 1804, Colonel John Stevens, who had bought the confiscated estate of William Bayard, known as Castile, founded the city of Hoboken. One of the first measures was to build a road to Hackensack and to the Five Corners to bring travel from the different villages to his ferry. In December, 1804, the Associates organized the Newark Turnpike Company, which built the road now known as Newark avenue from Warren street to the Hackensack river. Through lower Jersey City it was a madademized road through a marsh. 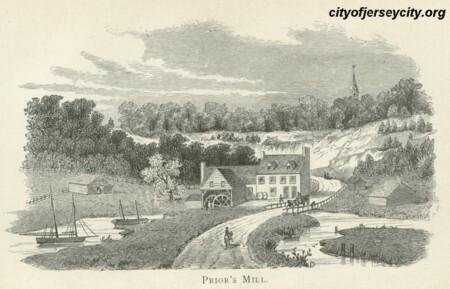 Previous to this there were but three roads in Harsimus -- one the causeway leading to Paulus Hook now known as Newark avenue, second "the road to church and mill." This followed what is now the line of Henderson street, along the shore of Harsimus Cove to First street, where a bend carried it to the corner of Grove street and Newark avenue; thence it followed the present line of Newark avenue to Monmouth street, along the foot of a sand hill which was the site of an earthwork outpost erected by the British during the Revolution. The last vestige of this hill, at the cornet, of Mercer and Brunswick streets, was removed in 1894. From this hill, nearly on the line of Railroad avenue, the road ran to Prior's Mill on Mill Creek just below the Point of Rocks, thence by what is now Academy street to the village of Bergen. The third road began near the Van Vorst house on Henderson street and ran northwesterly to a point where Jersey avenue and Second street now intersect & thence at an angle to the base of Bergen Hill, where it crossed the road built by Stevens to Hackensack. The Associates built several little piers and a retaining wall along the east side of Hudson street from Grand to Essex, which served as a wharf for light draught vessels. They partly graded several streets and set out along them some six hundred shade trees, among them some Lombardy poplars, of which almost the only survivor is, or was recently, still standing near Mills' Oakum works on Wayne street. Lombardy poplars were introduced into this country by Andre Michaux, a French botanist, who came here in 1786 with letters from Lafayette to Washington. He was authorized by the New Jersey Legislature to acquire an alien's title to two hundred acres of land and to "establish a Botanical Garden at Bergen." His place was known as the "Frenchman's Garden," and is now included in the "Macpelah Cemetery."